Over the past three decades, the declining interest rate environment rewarded bond investors. That environment no longer exists. Today, investors face significant challenges navigating through the rising rate environment. The US Treasury Department’s Office of Financial Research (OFR) recently published the OFR 2017 Financial Stability Report. Of particular interest is the OFR's discussion on interest rate sensitivity of the current fixed income markets. 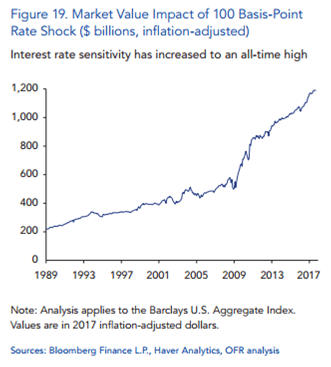 The OFR calculates that "at current duration (interest rate sensitivity) levels, a 1 percentage point increase in interest rates would lead to a decline of almost $1.2 trillion in the securities underlying the U.S. Barclays Aggregate Bond Index." (See chart below.) Goldman Sachs estimates that the size of the U.S. interest rate sensitive fixed income market totals almost 2.5 times larger than even the Barclays Aggregate Index. According to Bridgewater Associates founder, Ray Dalio, “A 1 percent rise in Treasury bond yields will produce the worst price decline in bonds that we have seen since 1980 to 1981." Quantitative tightening will result in the Federal Reserve gradually shrinking its $4.5 trillion balance sheet by an expected $1.5 to $2 trillion. Prior to the financial crisis, the Fed’s balance sheet totaled less than $900 million. At the same time, we expect the Fed to continue its gradual increase of the Fed Funds rate. Even with the advantage of history, judging the effect of just a change in the federal funds rate proves difficult enough for investors. Now add to that analytical difficulty by simultaneously reversing two monetary policy variables—not just one. As with the shift to QT, history provides investors with little basis for making judgements when combining the reversal of two policies. The Office of Management and Budget (OMB) projects short term interest rates to rise above 3 percent in 2018, followed by an expected increase to nearly 4 percent by 2020. By then, the interest on the debt will almost double. It will consume nearly 10% of the budget (these estimates do not include additional deficits due to recent tax reform). Looking out a little further, leading fixed income fund manager, Jeffrey Gundlach, warns that interest rates could increase to 6%. If the OMB forecasts prove correct, then this means the government will spend more on interest than on national defense by 2021. The following year, interest expense for the federal government will surpass all other discretionary spending. Over the past three decades, the declining interest rate environment rewarded bond investors. That environment no longer exists. Today, investors face significant challenges navigating through the rising rate environment. Therefore, investors should consider 1) reducing interest rate sensitivity using shorter duration debt investments and 2) incorporating diversifying alternative strategies. These steps become more necessary in order to achieve long-term investment portfolio objectives in a rising interest rate environment. SkyView partners with clients to provide comprehensive investment solutions. The information contained on this website is not intended to be used as the sole basis of investment decisions and is not a recommendation nor a solicitation to buy or sell any securities or investment. It is intended to be informational and educational. The information provided should be used as a general guide to investment performance. Past performance is no indication or guarantee of future results.